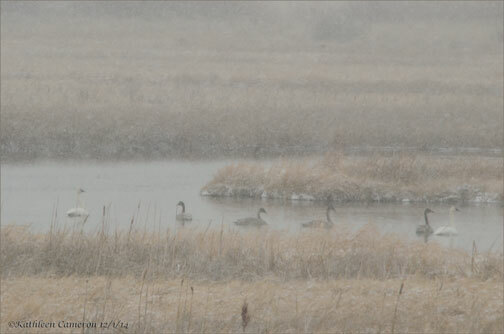 When Monday December 1st arrived it was snowing and it had been way too long since I had made or found the time to get out for some birding. Recent reports of swans at TNC Silver Creek Preserve and Harris’s Sparrows at the fish hatchery north of the preserve were calling me. I loaded up and headed out. Driving south on Pumpkin Center Road I saw a mixed flock of American Robins and European Starlings imitating a minimalist way of decorating a bush for the holiday season right next to a blow-up snowman in a front yard. Then I saw some Black-billed Magpies. Next came a Blue Heron in that odd looking hunchbacked position that they sometimes assume while solitarily standing in a field. 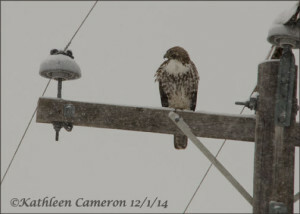 Then next came this Red-tailed Hawk on one of the power poles along the road. It was wasn’t snowing very hard at this moment so the hawk had a fairly good view of the surrounding bare fields. The snow did interfered with me judging when the hawk was in focus. Snow does that. I continued southward and saw several more Red-tailed Hawks perched on wheel lines, and a couple of Northern Harriers as well. 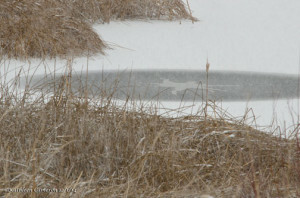 Mallards were dabbling in Loving Creek. I crossed highway 20 and continued into the western section of Silver Creek Preserve. At this point in the preserve I saw very few birds other than some Black-billed Magpies and two Song Sparrows. As I neared the rise to drive up the west side of the hill to overlook Sullivan’s Pond I saw several pairs of American Kestrels. 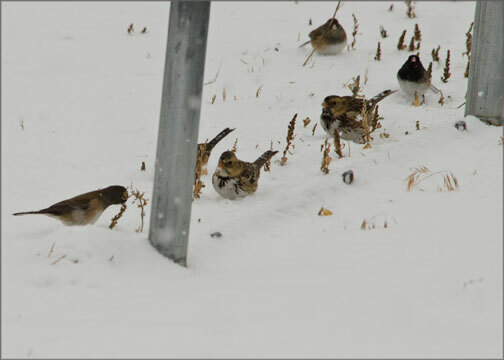 They are so flashy in the snow! I parked on the road above Sullivan’s Pond and glassed the waterfowl foraging in the various sections of the pond. 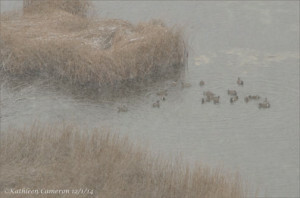 Mallards, Gadwalls, Common Goldeneyes and American Wigeons were the predominate species. 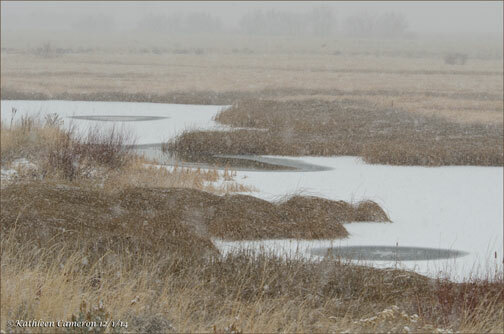 The snow was now falling more heavily. I took a few photographs of some wigeons and I found the results of the influence of the snow quite pleasing. To me the scene was now painterly, impressionistic, soft and lovely. 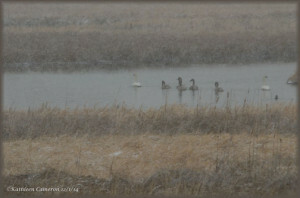 Driving further into the preserve I found what I was hoping to see, Trumpeter Swans, adults and cygnets. 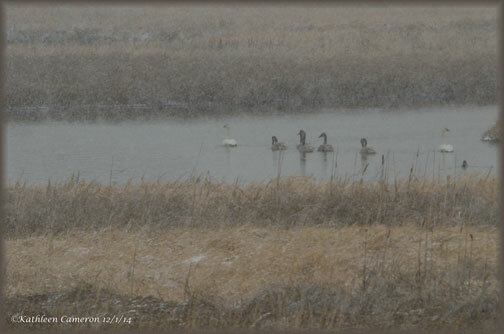 Swans are beautiful in and of themselves but through the falling snow they are ethereal. 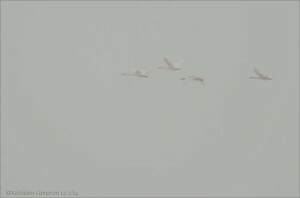 I spent about 20 minutes in the vicinity of the Swans. The amount of falling snow changed a few times while I was here altering the mood of the area and the visibility significantly. While I was appreciating these changes I took a few photographs of the habitat. 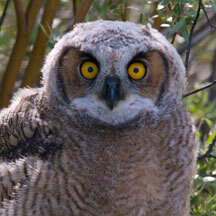 In the midst of taking the habitat shots this happened. 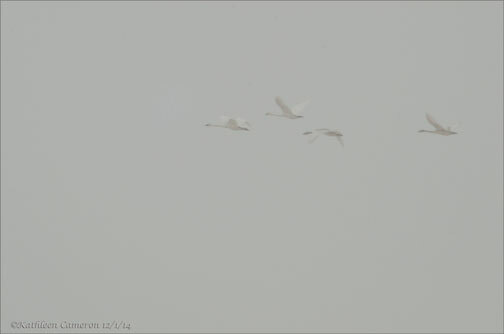 I heard them trumpeting their fly-by and it was very hard to find them in the sky through the falling snow. Back to the interesting habitat. This perfect circle with a thin layer of new ice forming looks to me like some big ole duck recently sprang to flight just before the ice reached it. Along the road exiting the preserve I noticed another Red-tailed Hawk blending in very well with the last of the fall leaves. 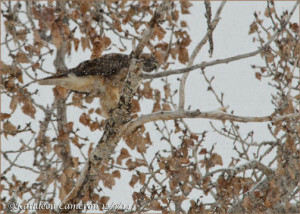 Good try hawk, I see you even though the falling snow makes you look blurry, bark-like and fragmented like a bunch of leafs. My next stop was the Hayspur Fish Hatchery. 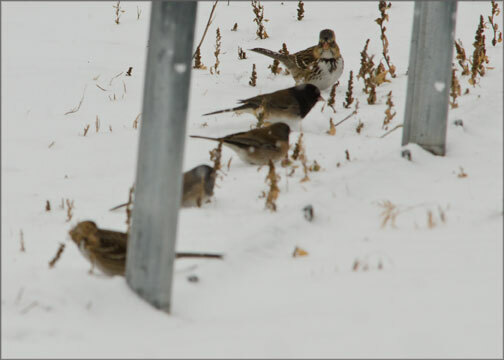 Several of my friends have reported the presence of the two Harris’s Sparrows at the hatchery so I stopped and got out of the car to walk around. Just as I took my first steps a Wilson’s Snipe sounded its alarm call and frantically flew from one edge of the hatchery pond to the other. I could hear Black-capped Chickadees and I heard a couple of notes from a Virginia Rail. 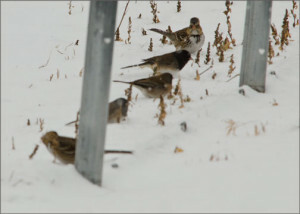 I had walked about three fourths of the loop we birders travel on the grounds of the hatchery when I saw a small mixed flock of birds containing Dark-eyed Juncos, a Song Sparrow and hum, two other sparrow species flying. The little flock landed between the concrete fish raceways offering me a chance to take a closer look at them. Sure enough there were the two Harris’s Sparrows. Harris’s Sparrow are just so elegant! At this point I decided that it was time to head home. The snow was still falling at a pretty good clip and along the way I stopped for this shot. 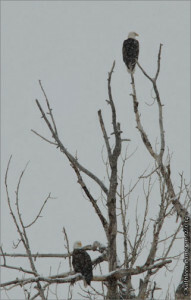 Bald Eagles are a stand-out even when falling snow makes them appear to meld into the flat gray sky. 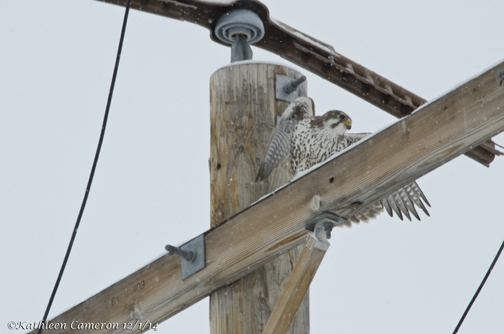 The last treat for the afternoon besides seeing about 7 more pairs of American Kestrels was this Prairie Falcon. The snow had almost stopped making it easier for it to see its prey and off it dove. 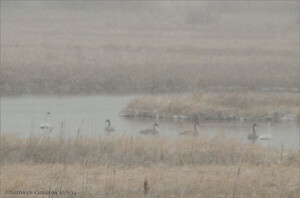 Birding during the gentle snowstorm on December first was a good start to my winter birding adventures. I am so glad that I ventured out to enjoy the sights, sounds, the crisp air, and the impact of the falling snow. I am happy to announce that the owl documentary that I have been working on since 2004 is finished and is going to premiere! 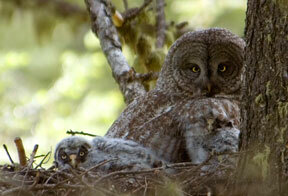 Connecting with Owls was filmed entirely in Idaho and it documents the beauty of owls in their natural habitats. Making this film has been a journey of discovery and deep personal satisfaction. 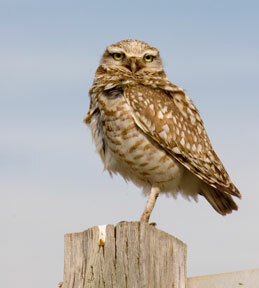 The owls featured are; Barn, Long-eared, Short-eared, Great Horned, Great Gray, Boreal, Northern Saw-whet, Burrowing, Flammulated, Western Screech, Northern Pygmy, and Northern Hawk Owl, with cameo appearances by: Snowy and Barred Owls will premiere at the Hagerman Bird Festival on February 14, 2014 at 6:00 p.m. at the American Legion Hall, Hagerman, Idaho. I will be posting a link to a preview of the film next week. I hope that you will be able to attend the premiere. Please stay tuned for more information about Connecting with Owls, a Cameron Multimedia LLC production in association with Majestic Feathers Films.